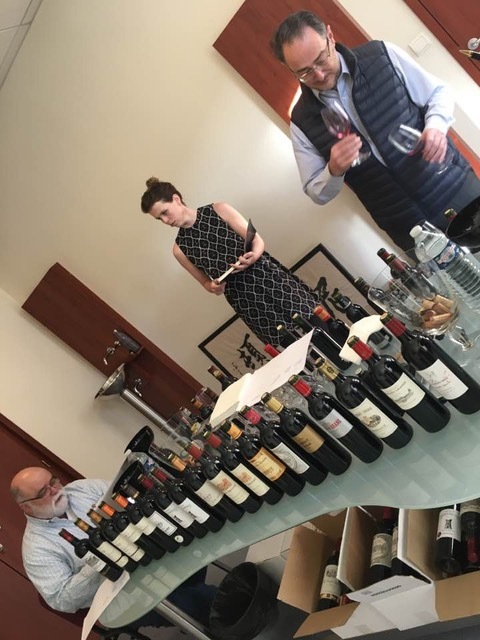 9:00am the morning of Thursday March 30th brought us to the offices of negoçiant Nathaniel Johnson on the Coeur du Medoc in Bordeaux for a brisk tasting of 34 wines. After that it was off to the right back for a series of chateau visits to taste mainly 2016s. 2016 Highlights from the office tasting include Ch. Tour St. Bonnet Medoc 2016 (90+), Ch. Senejac Haut Medoc 2016 (91+), Ch. Mauvesin Barton Moulis en Medoc 2016 (91), and Ch. D’Issan Margaux 2016 (93+). Highlights of some of the currently available wines include Ch. Tour Salvet Haut Medoc 2014 (91), Ch. Daugay St. Emilion 2005 (92+), Ch. Lalande Borie St. Julien 2014 (92), Duluc de Baranaire Ducru St. Julien 2014 (92), and Margaux de Brane Margaux 2015 (91+). First stop on the right bank (after a traffic jam near Libourne) was Ch. Daugay St. Emilion with the irrepressible Jean Bernard Grenie. Both the 2015 (92+) and the 2016 (93) are showing very well. 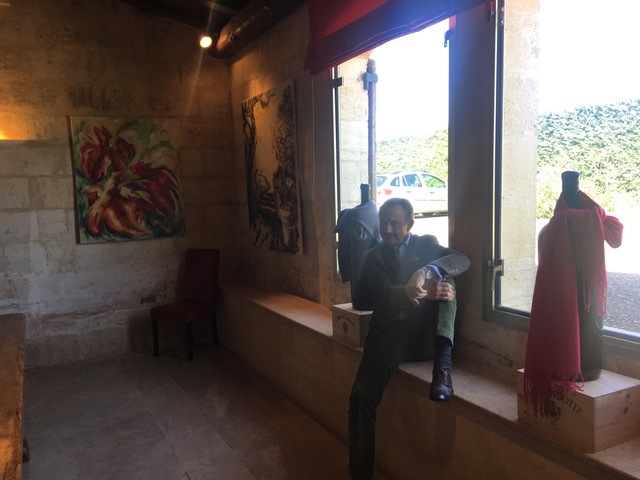 Daugay then gives way to a tasting with Stephan von Neipperg at Ch. Canon La Gaffeliere. You will be shocked to learn that the count was wearing neither an ascot or a scarf nor did he have a sweater draped over his shoulders. He did however ably present seven excellent wines: Ch. Clos Marsalette Pessac Leognan Rouge 2016 (93+), Ch. d’Aiguilhe Castillon 2016 (92+), Clos de l’Oratoire St. Emilion 2016 (93), Ch. Canon La Gaffeliere St. Emilion 2016 (96+), and Ch. La Mondotte St. Emilion (96) along with the rarer white Ch. 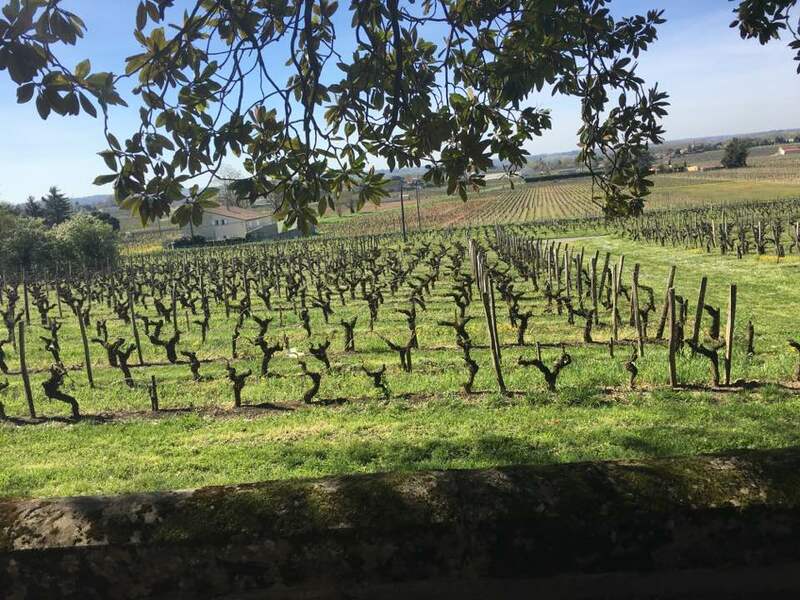 Clos Marsalette Pessac Leognan Blanc 2016 (92), and Ch. d’Aiguille Castillon Blanc 2016 (92). Our next stop was Grand Corbin Despagne to taste both that wine and special Ch. Ampelia with François Despagne. Ch. Ampelia Castillon 2016 (92+) is the best Ampelia yet. Ch. Grand Corbin Despagne St. Emilion 2016 (93+) also stands out. After our visit and tasting, we were treated to lunch at Grand Corbin Despagne that included the lovely 1970 served blind. Bragging a bit, I did guess the vintage so my record at Grand Corbin Despagne is intact at 2-0 (since I also correctly guessed the 1959 he served three years ago). 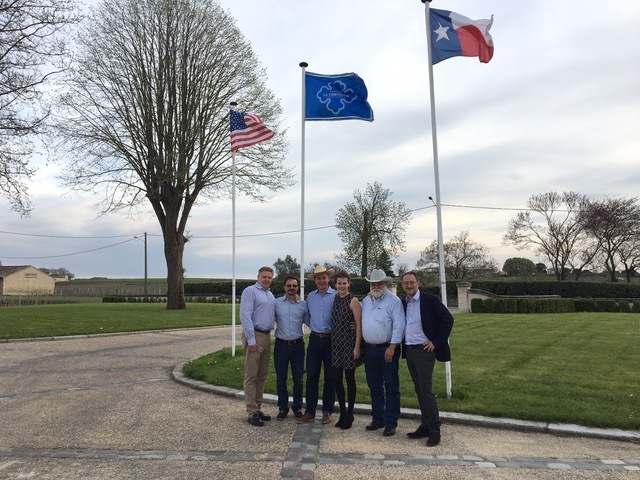 As Grand Corbin Despagne is next to Pomerol, we headed to our three Pomerol stops to taste Ch. La Pointe 2016 (92+), Fugue de Nenin 2016 (91), Ch. Nenin 2016 (93) and Ch. Clinet 2016 (94). After Pomerol, we visited and tasted at Ch. Tour St. Christophe in St. Emilion. While these wines (owned by Mr. Kwok) were well received by others, I struggled with what seemed to me to be too much wine making to the point where the winemaking overwhelmed the terroir. At this point, I will say that these are wines I don’t understand very well and so am not going to score. 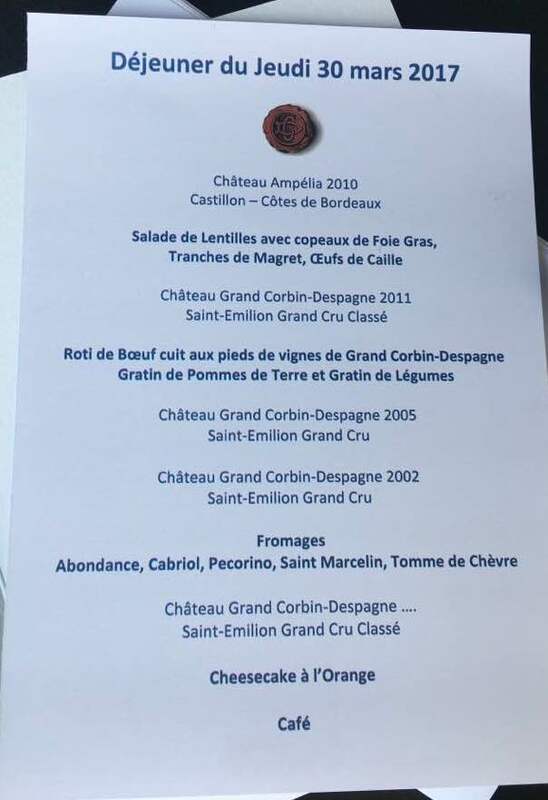 This entry was posted in Bear Dalton, Bordeaux and tagged Bordeaux 2016, Canon La Gaffeliere, Clinet, Daugay, Grand Corbin Despagne, Johnston, La Confession, La Point, Nenin. Bookmark the permalink.